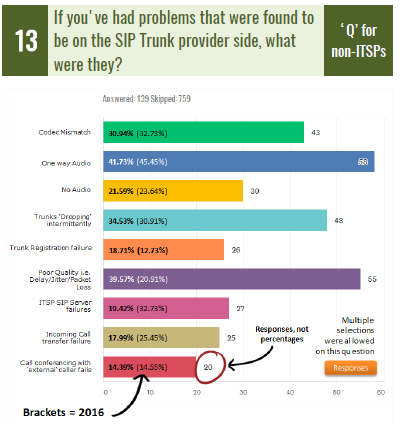 As The SIP School’s 2017 SIP Survey shows, many SIP trunk provider problems persist. You would think by now that SIP trunking would be a commodity implementation -- not so. The SIP School performs a survey every year that includes both SIP trunk providers and equipment vendors, and I have published No Jitter blogs about the results for the last several years. This year's survey continues to prove that although the knowledge is out there, the providers and equipment vendors still have problems. Every year I read the survey, I optimistically think the problems will decrease in number or prevalence. However, that seems to not be true for the SIP trunk providers. When asked where primary issues have been for companies experiencing problems with SIP trunks, 36.73% of respondents pointed to the SIP trunk provider, up from 33.63% in 2016. Second to that is edge device vendors (i.e. SBC, NAT) at 20.15%, a modest improvement from the 23.51% reported in the 2016 survey. Next up, 14.03% reported problems lying with the PBX and its configuration, another modest improvement over 2016 results (16.67%). Surprisingly, 19.9% of respondents report they do not have problems with their SIP trunks. This is down from 21.73% in 2016, a slight improvement. But think about it: This means that four out of five SIP trunk implementations have some kind of problem. So it's fair to say that the customer as well as the provider has to do more homework. When you analyze the specific problems on the SIP trunk provider side, you find that one-way audio is still a dominant problem, although it has decreased by about 4% over last year. The second most common problem is poor call quality, which has increased significantly from 20.91% in 2016 to 39.57%. If the industry does not know how to improve call quality, we are in big trouble. The answers to improving call quality have been around for over a decade. The next biggest problem is trunks dropping intermittently, which has worsened from 30.91% in 2016 to 34.53%. Finally, trunk registration failures also increased from 12.73% in 2016 to 18.71% in 2017. But not all is lost. There have been some improvements: Problems reported with codec mismatch, no audio, server failures, incoming call transfer failures, and call conferencing problems have all declined. Interestingly, The SIP School also asked questions of the providers, or ITSPs. 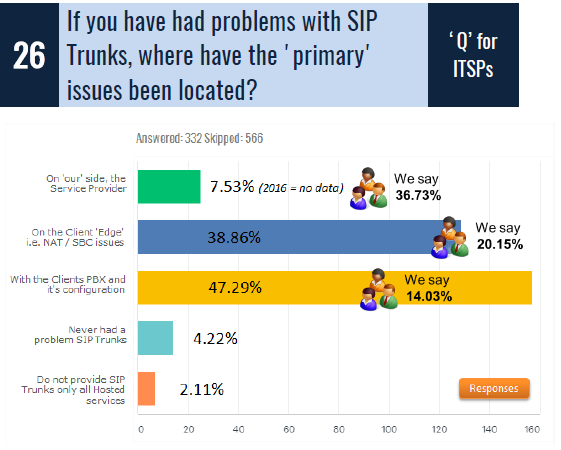 When ITSPs were asked where the primary issues with SIP trunks were located, the providers report that the client's PBX configuration is by far the biggest problem at 47.29%. That is followed by the edge device problems (SBC and NAT) at 38.86%. What I find most interesting is that 4.22% of providers report they have never had a problem with the SIP trunk, but 80.1% of customers had. The responses from ITSPs about problems do not match what the customers see as problems. This makes me wonder who is more accurate at reporting problems. The results of customer trials of a SIP trunk provider lead to 57.4% staying with the provider. A bit of a surprise is that 22.19% never attempted to trial the service, and opted to just install it right away. Another 15.98% are still testing, while a very small number -- 3.55% -- moved to another provider for a new trial. Although it is very small portion, at 0.89%, some customers removed SIP trunks and reverted back to TDM connections following a trial. The take away from this survey question is that if the ITSP gets it right, they keep the customer. This is a strong incentive to work hard in both the trial and deployment stages to meet all the needs of the customer. In the next blog, I will be exploring SIP trunk problems relating to equipment vendors including the PBXs and SBCs.